Our Tar Kettles and Tar Kettle Roofing Equipment from Roofmaster are built for the longest life and reliability. 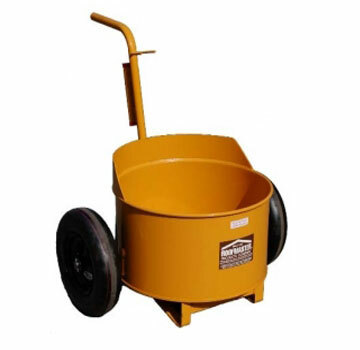 We have all type of hot tar asphalt roofing equipment including sprayers, material carts, mop carts, hot asphalt carriers / hot luggers , asphalt pour pots / tar buckets, moppers, mops and related commercial roofing equipment. 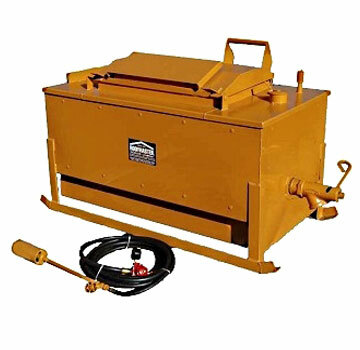 Roofmaster powered roofing equipment includes roof scrapers/ spudders, roof saw blades, roof dryers, felt slitters, roof saws with HEPA vacuum, power roof brooms and more. The Roofmaster Feltmaster felt layers are the best available. We offer in all types of configurations. We are happy to order any Roofmaster item and ship anywhere. Contact us and we will save you money. 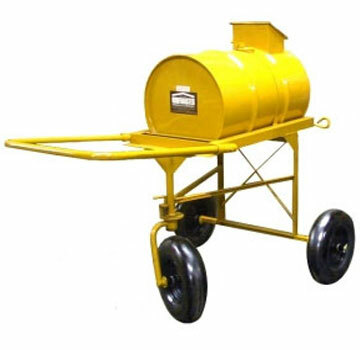 The Hotmaster Hot asphalt carrier --Once it's hot, keep it hot. 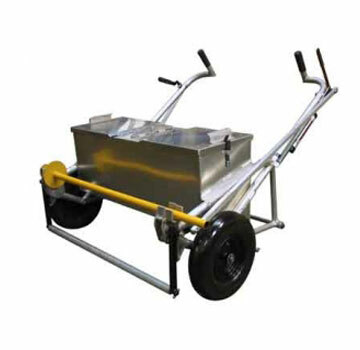 Available in 30, 55 and 110 gallon luggers, the HOTMASTER is constructed using a pressure-tested steel drum, mounted on a well-balanced cart with three 400x8 Non-Flat Lite tires, one a locking swivel wheel. Insulated model is covered with 2" thick fiberglass and set inside a sheet metal out shell. Includes a 2.5" Draw-off Valve set 27" above ground level. The Feltmaster is all aluminum construction for light weight. Switch from 36" to 40" quickly. Use 5 or 7 square goods at a single pass. 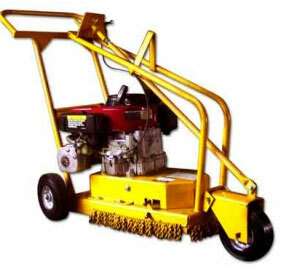 Includes control to apply a brake to one wheel while lifting the lower paper roller for easy threading of paper. Adjustable valve to be able to vary the amount of hot delivered to the deck. Asphalt valve at the rear so that the operator can watch for voids to eliminate potential leaks. Lids seal with silicone gasket to help reduce spilled asphalt. Note: Make sure there is a spotter to broom in the felt and observe the path of the operator in case of an unguarded skylite or roof edge. This unit has an insulation covering on the outside to conserve heat. This unit has Non-Flat Lite tires for the lowest maintenance. This Mopmaster with 4.00 x 8 Non-Flat Lite tires. Leak proof and long lasting construction. Wide "footprint" prevents tip over. Lightweight design. Ergonomic handle and mop handle retainer with Instruction Tube. Also includes a "wind shield" to help shield the cart from high winds spreading hot as the mop is being taken out of the cart. Popular wherever you have a rough surface.. 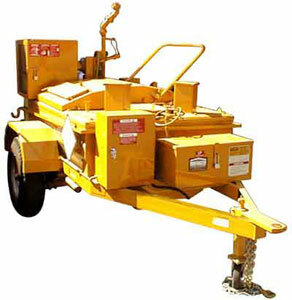 The SuperScratcher AllRotary Action Spudding Machines feature single lever adjustable cutting height, inset rear wheel for close-up work, pulley enclosed in safety shroud and 8x2.50 semi-pneumatic tires. 12" solid steel flywheel with four carbide-tipped scratcher teeth will spud a 12" path to within 1" of walls, up to 10 squares per hour. Available with 5.5 to 11 hp Honda engine and with double beltsand pulleys. Roofmaster Power Saws with HEPA Vacuum are made of the highest quality steel components in the industry. All engines are state-of-the-art technology conforming to all Federal & State regulations while producing the highest optimum performance possible. A very important feature is the Uni-tracking ability that allows the saw to cut in a true straight-line and prevents drifting while cutting (other saws tend to drift off-line). 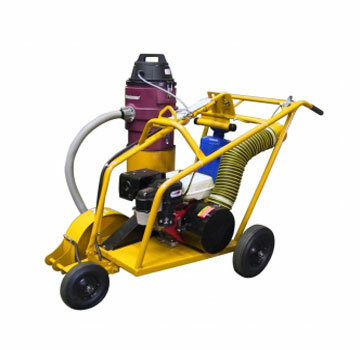 Features: 9 to 13hp Honda Engine Water Sprayer wets down all particles & dust eliminating most airborne contamination HEPA vacuum system vacuums up any remaining particles/dust not wetted by spray Ergonomically balanced for LESS fatigue Remote Breather helps engine stay cleaner & run cooler 12" Carbide Tipped Blades (581200).